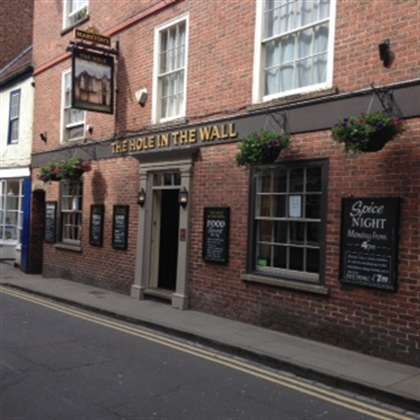 The Hole in The Wall is situated just fifty metres from the historic York Minster, next to one of the gates to the old city of York on High Petergate. We are the perfect place to come and have a hearty pub meal before continuing your exploration of this magical city. With so much to see and do you’ll need sustenance which is readily available on the extensive pub food menu plus we also offer a wide range of cask ales. Join us on Monday night at The Hole in the Wall for Curry Night with a FREE drink for £7.49, Tuesday we have live music, Wednesday is Grill Night where you can get a FREE bottle of Hardys wine with 2 grills, and on Thursdays for our pub quiz. Originally known as ‘The Board Inn’ the pub is haunted by the mysterious footsteps. At the West End of the Great Nave of York Minster stood a door, which lead to the chapel of the Holy Sepulchre. In 1816 excavations of the Board Inn revealed a dark secret. A hole was found which lead to a dungeon, where chains and manacles hung. A tunnel, also found, was bricked up by a superstitious builder because of accounts of eerie footsteps that echoed from the darkness. These footsteps, it is claimed, can still be heard today. The chapel pub was demolished and the Board Inn assumed the present name. The pub is situated upon one of England’s oldest streets, High Petergate, which was the Roman main street via Principans: Bootham Bar being the main gate to Eboracum…..York. In 1501 a knocker was placed on the door of Bootham Bar so that the Scottish persons who were wishful to enter should knock first and ask permission from the Lord Mayor. An order which is still believed to be in force. At the side is Little Peculiar Lane, celebrated as one of the shortest and most detectable of all the snickleways for it’s awe-inspiring view of the Minster. Clifford’s Tower - As one of the most important cities in England, and an important base for holding and administering the north, York was the site for two of the castles William the Conqueror built in the years immediately following his conquest. The principal castle was begun in 1068, as part of a campaign to subdue anti-Norman sentiment in the north. Its wooden defences focused around and atop the motte; they were destroyed during a local rebellion the following year, but rebuilt by the Norman’s after suppressing the rebels and taking harsh reprisals on York. In the latter half of the thirteenth century, the keep was rebuilt in stone. It was given a quatrefoil plan, of which there is no other example in England. The keep later became known as Clifford's Tower after Roger de Clifford, who was hanged there in 1322. York Dungeons - The York Dungeon brings York’s horrible history to life with 11 live shows, actors and special effects. We’ll keep you updated with great offers, and news of what’s happening here at the Hole In Wall.